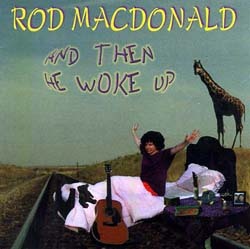 Rod MacDonald "And Then He Woke Up"
The new album, Rod's first new release since 1994, features some of Rod's best songs, from the social commentary of "Who Built the Bomb (That Blew Oklahoma City Down)?" to the shadowy "Me and Uncle Joe" to the whimsical "Happy All the Time." One of the leaders of the folk revival of the '80s, Rod MacDonald has been a major force among singer/songwriters since being one of the primary organizers of the Greenwich Village scene (Rod founded the Greenwich Village Folk Festival in 1987). Two critically-acclaimed releases in the 1980s ("No Commercial Traffic" and "White Buffalo") led to continuous touring. In the 1990s, Rod released "Highway to Nowhere" and "The Man on the Ledge".